The Vertical Mill – Finally we can make flat things « Adafruit Industries – Makers, hackers, artists, designers and engineers! Quinn Dunki posts an extensive discussion on Blondihacks about lathes and the vertical mill. A vertical mill is essentially a lathe stood on end with a large milling attachment permanently affixed. It’s arguably the current “standard” for multi-point machine tools (in contrast to the single-point cutting tools like lathes and shapers). The vertical mill is far from the first attempt to optimize the flattening operation on a lathe. Flat surfaces and features were previously made on things like shapers and metal planers. 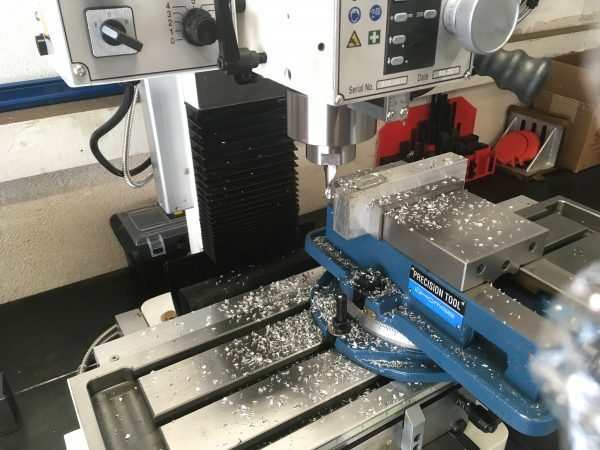 A shaper is particularly useful, because it’s extremely adaptable to different operations, can reach inside parts in ways other tools can’t, and can use the same tool bits as the lathe (perhaps with a slightly different grind). However, as the old machinist’s joke goes, “you can make anything with a shaper except money”. Shapers are versatile, but they are not fast. Vertical mills are fast, so as soon as metallurgy and manufacturing advanced to the point of making complex tooling like end-mills practical, milling machines came to dominate. See a full discussion with plenty of pictures on Blondihacks.